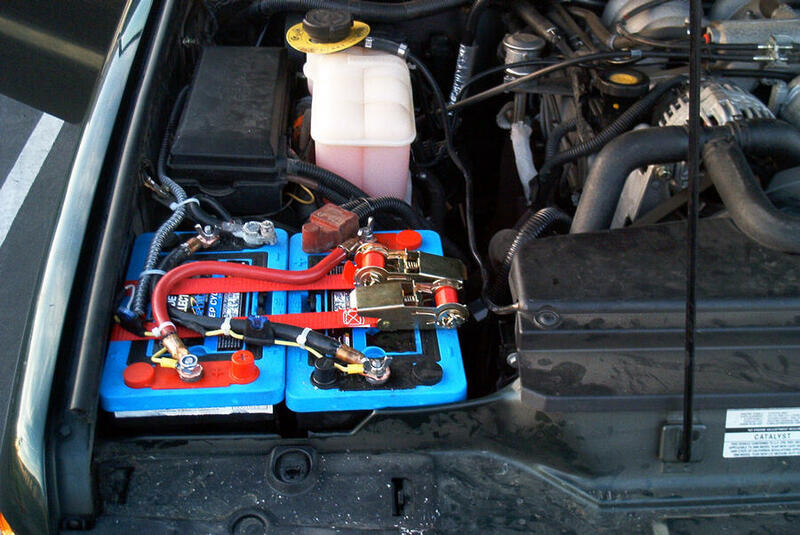 Today (Apr 28, 2002) I replaced the single battery that came stock with My Truck with two deep-cycle Exide Orbitals. This increased my available power by 38%! Also, because the new batteries are deep-cycle, I can safely turn off my engine, and play with my radios, laptop, etc. without worrying about damaging the battery. The installation was not too complicated, but took me about 4 hours. This includes figuring out the mounting, fabricating the mounting, and installing everything. A good sunday in my book. 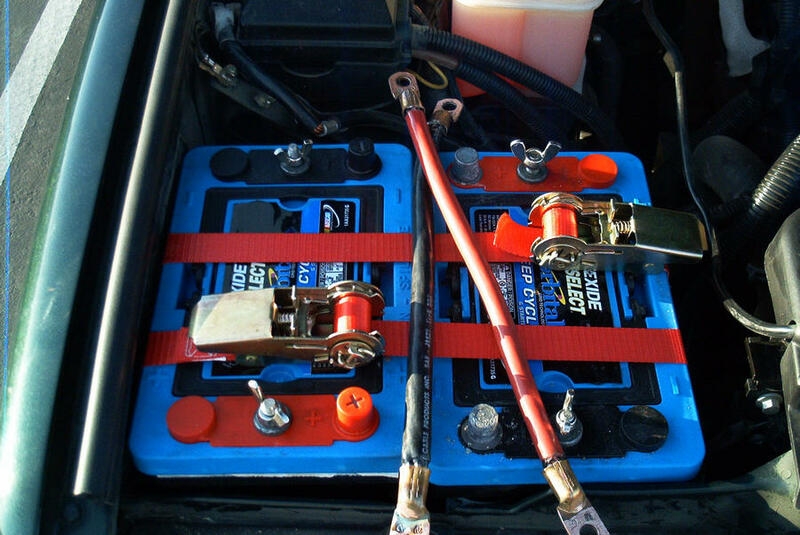 Here is one of the new batteries, installed for a couple of days in the stock battery housing. The conduit on the left is the direct-to-battery power for my radios, etc. I have removed the battery, plastic battery housing, and moved aside the battery wires. These are the brackets I made, that bolt to the bottom of the battery tray area, to keep the new batteries off the bottom, and level. The final fitting of the batteries. They are sitting on their brackets, and strapped to them with two ratcheting straps. The two large wires crossing over them are the connector wires I made. Final fitting of all the wires. Volt meter shows 12.3 volts, and the engine fires up just fine. As expected, because of the loss of power while I was installing the new setup, the ABS system is pissed. I'll have to get that reset the next time I'm at the dealer. All finished! A happy, running engine with dual deep-cycle batteries. I had to replace the wing-nut on the left battery so it doesn't contact the hood, but other than that, the installation went without incident. I also took the local speed bumps way to hard to test out the strength of the mount, and everything is still rock solid. I'm very happy. I've been living happily with my dial Orbital setup for almost a year! Since then, I've done some re-wring, but the battery connections have stayed the same, I've just run off a couple of extra circuits. Now it's time for version 1.2. I want to run a large number of circuits out of a fuse/relay box in the back of my truck. To do that, I'll run a large rating wire from the batteries to that box, from the front right side of the truck, to the left rear. A long run. I found a supplier of high-grade 2-gauge wire, and bought 15 feet. Unfortunately, 15 feet isn't long enough! I'll need about 10 feet more, which I'll splice into the first segment.Also unfortunate is that the Orbitals are to tall to fit in the space provided, when flipped around from the original configuration. 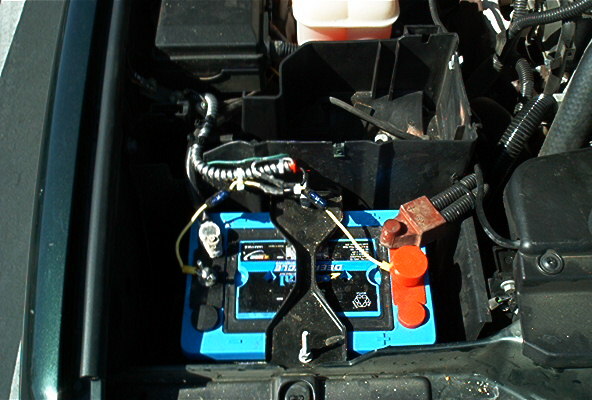 The right side battery's negative lead-block terminal prevents the hood from closing completely. Not to worry though! That terminal is unneeded and easily removed with a cable cutter. Here is the first 15 feet attached to the batteries. 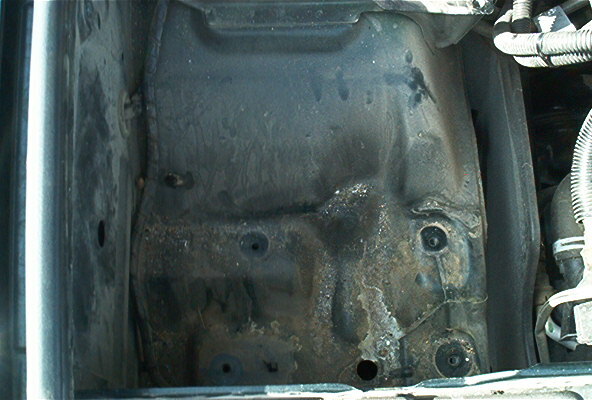 It's running along the right side of the truck, on top of the right frame rail, to about the rear axle. From there, it'll cross to the left side, then enter the cabin via an unused, grommeted hole, right into the bottom of the cubby I'm using for power distribution. I really like this setup, having all auxiliary circuits comming into one point, which can be easily removed. I think it'll be far less scary to repair shop people, and I'll be able to do much more with it. The large gauge of the wire means very low voltage drop, so I can plug solar pannels right into the breakout box, and there's enough amperage capacity that (with a current regulator) I can add temporary battery capacity in the cargo area. Ok, I ran the #2 positive lead through a self-resetting 80 amp circuit breaker, in case something wears through the cable, and shorts it to the truck frame. (That's the little black box on top of the batteries.) The cable runs along the top of the right side frame rail, then over to the left side, and into the cabin. I also ran a 1/0 negative lead into the power center, and grounded that to the frame. The positive lead goes into a marine battery switch, which will allow me to turn off the entire accessory circuit, or run it from the main batteries, or from an external power source (some more batteries), or, I can connect the main batteries to some external power source (more batteries). This whole setup gets me 80 amps to accessory circuits. Much more than enough for radios, lights, even tools. The plan is to get a main relay/fuse box from a junkyard to plug the accessory circuit into. This will reduce the cable clutter in that box substantially, and allow me to cleanly fuse each and every circuit to just what it needs. To turn that #2 wire into a useful form, I need a bunch of fuses and relays. The problem is, all those fuses and relays make a gawd-awful mess. So, to keep clutter to a minimum, I got a main relay/fuse box from a wrecked Jeep, and canibalized it for my needs. It came with five relay slots, and 14 fuse slots. This is more than enough for me, for now. I used all five relays, and have four extra fused, always-on circuits itching for a use. You can see the barrier strip I mounted to the side of the box to allow for attaching circuits, and the bundle of wires on the far side are the relay control wires. The two big fat wires on the back are unused 50ish amp circuits. All I need to do now is mount the box, connect it to main power, auxiliary power, ground, the relay switches, install the relays and fuses, and connect up all my radios and stuff. Here is the left, rear cubby in the truck, after before I put in the fuse/relay box. You can see the two grounding strips on the left, the big red battery switch on the right, and in the middle, my APRS tracker, and 300 watt inverter. On the far left you can see the secondary power source connector, a 170 amp anderson power-pole. And here is the power center with all the goodies connected, and wires somewhat arranged. This setup leaves me lots of room to grow, I'm very happy. Prasad Talaiver (2003-09-22): Great work, Did you have to modify the charging system? Erik (2003-09-22): No, my truck came with a 130 amp alternator, which does a great job charging them, even when they're almost dry. Ron (2003-12-27): Curious how you did the fuse center from the Cherokee. I just got one out of a Neon, 8 relays,6 maxi and 7 atc fuses. Problem I am having is getting the terminals for a custom setup. 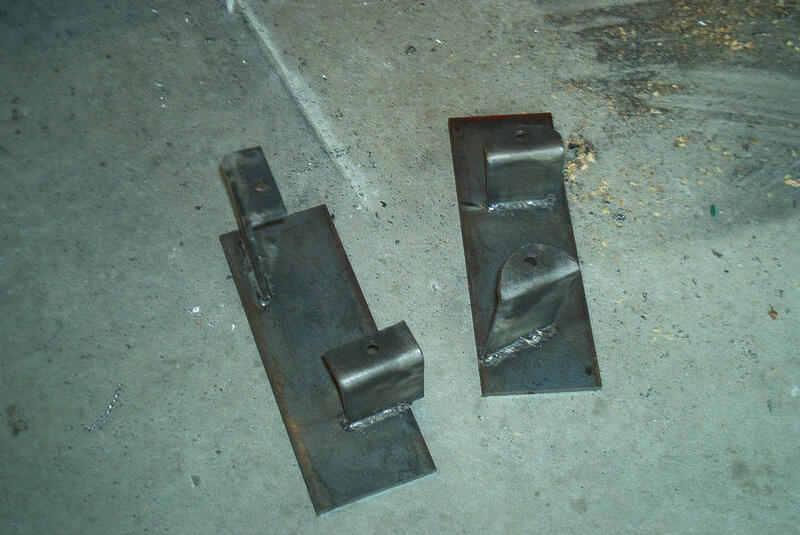 Did you just leave enough wire to work with, or did you use new terminals for inside the block? Any help would be great. Erik (2003-12-27): Ron, I did not replace the terminals. When I removed the fuse block from the Jeep, I left several inches of wire, which in most cases was enough to work with. In some cases, I had to extend the wires, but that's just a solder and shrink-wrap job. Erik (2004-02-27): "Farad" was an early electrical researcher, for whom the unit of capacitor storage capacity is named. As far as I know there's nothing named a "farad capacitor". Erik (2004-11-22): I have not re-done the capacity test, but I have seen no degredation of performance. I've been very happy with them. John (2005-04-02): I have a twin setup in my xj and found out through necessity that when hooked together can be used to weld with. Saved me a long walk. Erik (2005-04-04): I have heard of people using a couple of car batteries and a set of jumper cables to stick weld. Sounds like fun! mikerotch (2006-02-14): lol a 1 fara capacitor is about the size of a sports drink squeeze bottle. lol. and the 2nd thing is that a battery is actually considered a capacitor. A capacitor is just something that retains an electrical charge. So having two batteries is way better then just having a 1 farad capacitor. A 2nd battery is actually closer to a 8-10 farad capacitor. It just depends on the battery. Capacitors store a very small amount of power, and are able to absorb and release that power very, very quickly. 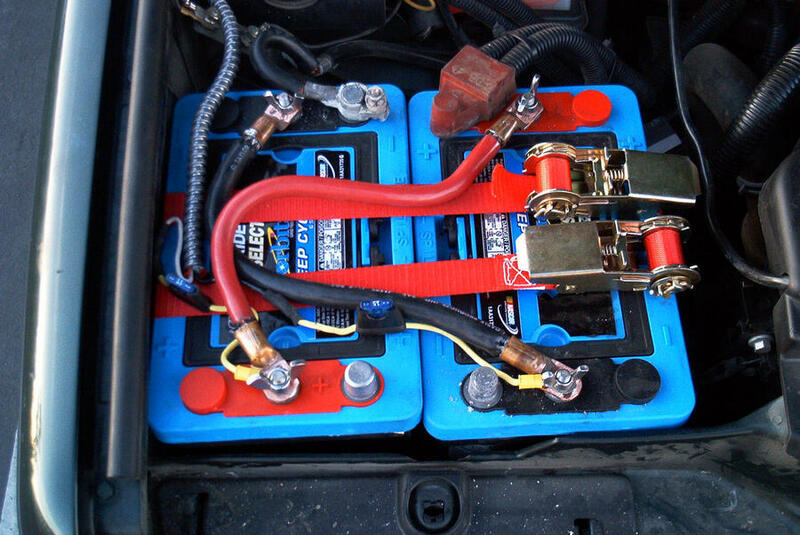 Batteries are able to store large amounts of power, but are slow to charge and discharge compared to capacitors. Capacitors are for things like flashbulbs, and smoothing out electrical power, but could never crank over a car. At least not without a whole lot of them, and complex, expensive control circuitry. Unusual Noob (2007-02-27): Nice explanation Erik:) So let me ask you your expert opinion. For a person (me) that just wants to install a remote start/alarm, dvd receiver, two 12" subs, memphis 1000w amp. What would be best, an extra battery or a capacitor? and if a battery, what would be the smallest size I can get away with? Thanks in advance. Erik (2007-02-28): Unusual, I have almost zero understanding of the power requirements of modern large sterio systems, or how the capacitor/battery decision is made. I'd think an audio shop or audio/car web site would have better advice. Joel (2008-04-06): "and the 2nd thing is that a battery is actually considered a capacitor" hahaha. As an electrical engineer, I can tell you they're totally different. Think of capacitors as having very high power density (i.e. high energy per second), so they are able to deliver energy very quickly, but small amounts. Batteries have very high energy density (i.e. high total amount of energy stored), but due to the chemical reaction inside, cannot release that energy as quickly as capacitors. Finally, to again correct "Mikerotch," a 1F capacitor back in the day WOULD be the size of a room. Recent developments in capacitor technology have led to the supercapacitor, also known as electrochemical capacitor, which can fit huge capacity in the size of your hand.